Please respect the visitation hours below and please avoid disrupting the medical care of our patients. * We respect our timetable as an implementation for our crime prevention. We ask for your cooperation. Please receive a visitor card upon completing a visitor registration card at the visitor registration counter. 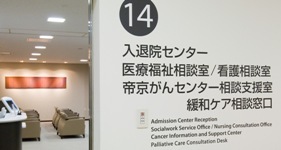 * Please swiftly return the visitor card to the visitor registration counter at the 1F inpatient registration center entrance upon the end of your visitation. We ask that persons who have symptoms including fever, cough, nausea, and diarrhea not to come for visitation. If such symptoms are confirmed, we cannot deny the possibility that such persons may have a infectious disease (eg flu, gastritis from norovirus). There are patients under our care whose immune system is compromised and in a condition that makes them vulnerable to infectious diseases. As this is a necessary measure to prevent infectious diseases at our hospital, we ask for your cooperation. As a rule, we do not respond to telephone inquiries on patients who are staying at our hospital to protect their privacy. We ask that visitations are conducted within the set time and kept short to keep the treatment and rest of our patients. Please be noted that there is no parking discount for visitors. Please refrain from visiting a patient who is staying at our hospital as a group including children. The hospital building premises are designated as non-smoking. We firmly reject any tips from you to our physicians, nurses, and other staffs. Mobile telephones may sometimes have an effect on precision medical equipment. We ask that mobile telephones are used respectfully and only in the permitted areas of the hospital premises. Copyright© 2013 Teikyo University. All Rights Reserved.